As a follow-up to a recent article, I just came across another new variant for Astonishing X-Men #51 when I was working on completing my Spider-Men #1 retailer variant collection. Heroes Aren't Hard to Find in Charlotte, North Carolina puts on the wildly successful Heroes Convention -- also in Charlotte. 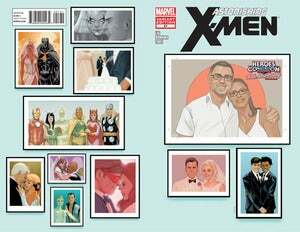 At this year's event back in June, they offered an exclusive "variant" of Astonishing X-Men #51. The issue includes an image created by Phil Noto of Heroes owner Shelton Drum and his wife Linda. I say "variant" because the comics weren't printed with the image, but rather the picture was professionally printed on label stock and placed on the blank area of the cover. Not a true printed variant, but one professionally manufactured. You can read more or get a copy on their site, and grab one of their many comic shop exclusive cover issues while you're there too.